Weston McKennie became the third-youngest person to score in his debut with the US national team. 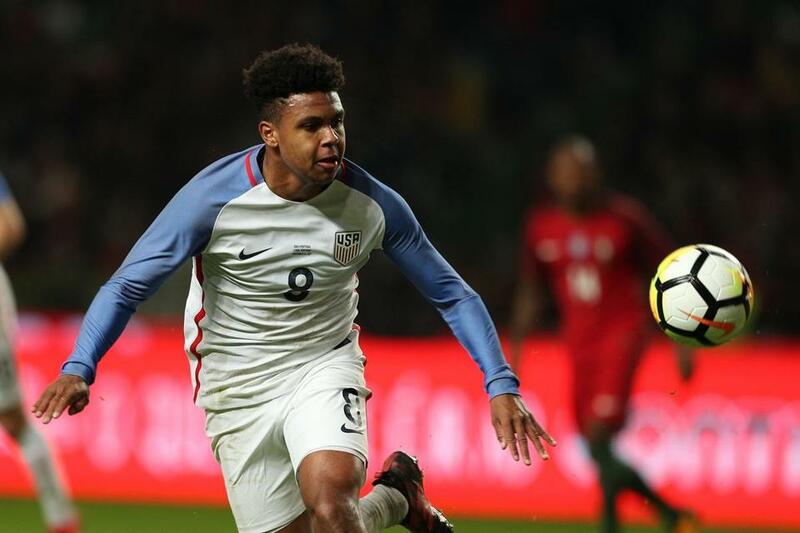 LEIRIA, PORTUGAL — Weston McKennie needed little time to make an impact for a US soccer team starting a five-year wait until its next chance to play in the World Cup. The 19-year-old midfielder from Texas scored 21 minutes into his national team debut, a 1-1 tie against Portugal on Tuesday night in the Americans’ first match since failing to qualify for next year’s World Cup. McKennie, who has played his way into German club Schalke’s lineup this season, took a pass from C.J. Sapong, used three touches to create space from Ricardo Ferreira and then beat Beto to the inside post with a right-footed shot from 12 yards. McKennie joined with 18-year-old midfielder Tyler Adams to become the first pair of teenagers to start together for the Americans since 1988 and became the third-youngest American to score in his debut behind Juan Agudelo (17) and Landon Donovan (18). The US team used eight starters 24 or younger in Dave Sarachan’s first match as interim coach, and the missteps of youth were on display against third-ranked Portugal, which rested many regulars. Ethan Horvath, a 22-year-old goalkeeper making his first appearance since his debut against Cuba in October 2016, allowed Vitorino Antunes’s volley from a flank following Bruno Fernandes’s pass to drop between his arms, through his legs and into the net for a 31st-minute equalizer. Horvath, who plays for Club Brugge, covered his face with his gloved hands. Adams made his first US appearance and Cameron Carter-Vickers, a 19-year-old son of former NBA player Howard Carter, became the third debutante when he replaced John Brooks in central defense at the start of the second half. Loaned this season from Tottenham to second-tier Sheffield United, Carter-Vickers put a header off the crossbar in the 55th minute. Eric Lichaj started at left back. Midfielder Danny Williams captained the US team for the first time and was in defensive midfield for his first appearance in 13 months. Kellyn Acosta was in central midfield with McKennie, a pairing that goes back to the FC Dallas youth academy. Agudelo and Adams were wide as part of a 4-1-4-1 formation headed by Sapong, who made just his third appearance. Josh Sargent, the first American to train with the under-17, under-20, and senior national teams in the same year, did not dress because of a strained right quadriceps.